After the success encountered in the first SIRIC program, the CARPEM (CAncer Research for PErsonalized Medicine) community decided to submit a brand new project. Three institutions are partners of this project: Assistance Publique – Hopitaux de Paris, Paris Descartes and Paris 13 Universities. The European Georges Pompidou hospital, the main institution is associated with Cochin and Necker, the 2 other Paris Descartes University hospitals. This association brings together 350 researchers and physicians dedicated to cancer care and research. They are grouped in 21 research and 11 clinical teams and are supported by 8 platforms. Their domain of competences covers Immunology, Genomics, Metabolism, Cellular Biology, Bioinformatics, Mathematics, Biostatistics, Medical Informatics, Microfluidics, Epidemiology and Ethics. These teams, beyond their well-recognized expertise in basic and clinical research, have an important know-how in translational research (bridge between clinical research and basic research). All research units have been evaluated as outstanding (A or A+) by the AERES. CARPEM participants identified 3 new major challenges for the next 5 years. The first challenge is to integrate metabolism in its broad sense, ranging from risk factors related to the lifestyle (physical inactivity, obesity, eating habits…) to molecular mechanisms induced in tumor cells or immune cells, with cell-intrinsic and immunosurveillance-related mechanisms of carcinogenesis. The ultimate outcome of this challenge is to define (i) preventive behaviors based on proven molecular knowledge, (ii) new therapeutic targets and (iii) new prognostic or predictive markers. The second challenge consists in the comprehensive study of tumor heterogenity which plays an important role in cancer treatment resistance and constitutes the next frontier for developing an effective precision medicine. The in-depth comprehension of heterogeneity at intra- or inter-tumor levels will allow us to identify new composite biomarkers and therapeutic strategies to delay resistance to treatment. The third challenge is the integration and sharing of data generated on a large scale by the technical advances implemented in both research and healthcare. This essential step requires the adherence of patients and volunteers involved in observational and interventional research programs. It requires the development of modern tools that use the most advanced information technologies to collect and integrate data. In particular, we will implement dynamic consent, which will allow us to respond to the ethical and societal questions raised by the increasingly porous border between care and research. The use of information collected within the framework of medical care and used for research is more frequent and essential for the improvement of patient treatments. 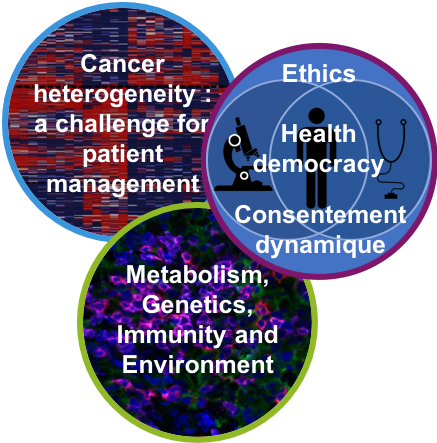 Through 3 integrated research programs, we want to provide solutions that will improve the patients prognosis by better defining their disease, by identifying new therapeutic targets, by preventing relapse and improving quality of life through a reasoned change in lifestyle, by fostering the adherence of society to changes related to technological advances and by making patients active players in cancer research. Thanks to their outstanding expertise in basic, translational and clinical research, CARPEM teams will be able to meet these challenges. Many members of the CARPEM are leaders of clinical research groups at a national level in particular in digestive cancers (Fédération Française de Cancérologie Digestive « FFCD », P. Rougier et P. Laurent-Puig) and gynecological cancers ( « GINECO »). All the national collaborations for researchers and clinicians are mentioned in the part dedicated to the resaerch teams description. Several CARPEM research team members are involved in European work groups. As an example, Pr Pierre Laurent-Puig is a member of EORTC (European Organisation for Research and Treatment Cancer) for translational resaerch in digestive cancers ; Pr Wolf-Hervé Fridman is member of ERC (European Research Council) and participates to the work group « new diagnostic et therapeutic tools ». • a scientific board which meets ones a year composed of nine leading experts in cancer who offer their scientific expertise, critical opinion and strategic research advice on translational cancer research. Thanks to their international recognition they can facilitate new international collaborations. • scientific seminars where french researchers as well as foreign ones are invited in order to establish new contacts and possibly new collaborations. • bidirectional exchanges with international teams facilitated by financing post-doctoral positions.